When I lived in nyc I religiously ate pho. My favorite place was Thai Son on Baxter between Bayard and Canal. I could have pho at any hour of the day, every day. My friends and I would frequently get together over pho. T’s order: Pho with the works and extra meat! C’s order: Pho with the works and extra noodles! After placing our orders, we would rush to get our condiments straight. We each vigorously blended our own preferred ratio of Sriracha and Hoisin sauce in small side dishes. Then we armed ourselves with chopsticks on the right and soup spoon on the left. 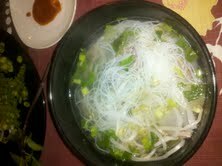 Finally when the pho arrived, we would slurp away without looking up or at each other until it was all gone. I made Pho for dinner tonight! It was delicious but just wasn’t the same without T and C.
oooh! looks good! I’ve never made pho, is it hard to make? Well, I didn’t have a lot of the spices I needed so I just improvised! Fish sauce made things all better! Come visit and I’ll make you some!